The internet went absolutely nuts yesterday, as seemingly every liberal with an internet connection screamed bloody murder because Melania Trump was wearing heels when she boarded Air Force One. The Trumps were heading down to Texas to survey damage from Hurricane Harvey, which has left Houston devastated. None of that mattered so much to them, though, once they saw Melania wearing heels. Of course, apologies were hard to find when she exited the plane wearing the white sneakers she had packed. 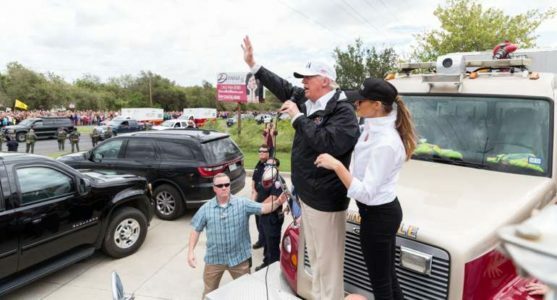 Melania Trump has bravely opted to survey the Harvey damage in aviator sunglasses, a flawless blowout, a silky olive green bomber jacket with what appears to be limited water repellant capabilities, and actual stilts. The president, meanwhile, has had his khakis pressed in preparation for a light drizzle on the golf course. I am trying to imagine something less appropriate and cannot, although something will surely happen tomorrow to give me new ideas. Official White House photo of President Obama and NJ Governor Chris Christie surveying hurricane damage in 2012. Wait, are those … are those … Barackhakis????? I should check Jezebel’s archives. I’m sure they blasted Obama for those pants too, right? Nope. Just checked. Couldn’t find a thing. Imagine that. Look, who gives a flying flip what anyone wore to go and see the destruction of one of this country’s largest cities by a massive hurricane? They could have worn clown costumes for all I care, so long as the president is doing his freaking job. Still, I found it amusing that they also took aim at Trump’s clothing choices … especially since it’s what the Messiah, Barack Obama, wore in an identical situation.